Winner of the JPF Music Award for “Best Self-Help Album of the Year.” Instantly change your eating habits with the proven effectiveness of hypnosis. Dr. Walton has been featured in Fox Entertainment and Bergen Health & Life Magazine. This album is on weight loss, however, it is not about judging the body you already have. It's about loving that body in all it's forms: heavy, skinny, and every other way just as it is right now. It's the only body you have, and the only one you'll ever have for the rest of you life. It will always be with you. Just love it and respect if for what it is. So, it's not as much about losing the weight that you carry on your body as it is about feeling the lightness you can carry in your heart. Dr. Walton's Ultimate Weight Loss deals directly with changing eating patterns by combining the immediate proven effectiveness of clinical hypnosis with cutting-edge weight loss strategies, psychological insights, and self-empowerment techniques. Together they form a powerful and effective treatment for taking control of your eating patterns and diet. By eliminating the urges that sabotage your efforts, you will be empowered to lose the desired weight, maximize the benefits of your weight loss program, and eliminate the urges to eat the wrong foods! Ultimate Weight Loss won first place in the prestigious 2009 Just Plain Folks Music Awards. 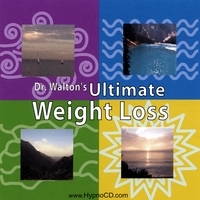 Ultimate Weight Loss, a combination of Dr. Walton’s coaching, guided self-hypnosis, meditation and an engaging musical score, was named Best Album in the Self-help category. This CD is an effective way to loose weight. It is not a one stop quick fix but something you have to reveiw on a weekly or monthly basis to loose weight and keep it off. I lost about 10 pounds in a month (something I have been trying to do for years). When I notice those few pounds starting to come back, I just listed to the CD again. It relly help me to be able to push myself away from the table without wishing for more food. Thank you Dr. Walton for this amazing cd.Your methods and detailed meditation made this an easy way to conquer my compulsive eating habits and I cant thank you enough.This cd is amazing.I have lost 8 lbs in two weeks and I'm blown away..
Dr. Walton has created the ultimate tool for anyone who desires to lose weight and needs some gentle reminders of unrealized habits and sound advice and daily listening motivations on how to lose those pounds sensibly. It works and it is natural! I love it. Have listened to the cd and have applied it to my daily lifestyle and with its help have lost 10 lbs. Dr Walton suggestions have really helped me understand my eating habits and have helped me to overcome my compulsive eating. whether you want to lose a lot or little weight.